Everyone's gathered at Aunt Agatha's mansion for the reading of her will. 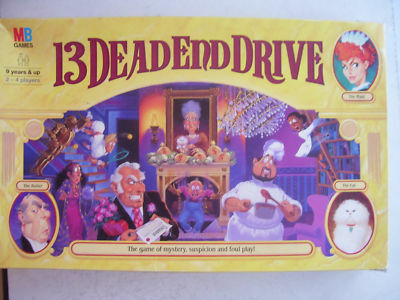 But only one of the 12 invited guests will inherit her fabulous fortune- the one that survives at 13 Dead End Drive! Who will it be? Her Gardener? Her best friend? Her Cat? The answers on the cards and in the traps! Pick your moment to play a card and bump off your rivals with the five hidden traps around the mansion. Watch out for the trip down the stairs, the crashing chandelier, the push off the ladder, the crashing statue, and the flip into the fireplace! If you can escape with your life before the detective gets to the front door, you'll escape with the loot!